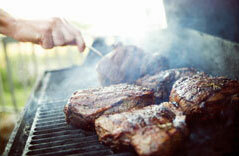 What Do You Need To Know To Determine When Steaks Are Done?. There are a number of ways to tell when your steak is done either visual or by aroma or by touch. To simplify the process we've collected the four most widely recommended methods to tell when your steak is done. The meat thermometer: Clearly the easiest and most exact. The only disadvantage is that you do pierce the meat, so there is some juice loss. The color test: Cut into one of the steaks and judge by color. Plenty of websites will guide you in this method. The problem with it is that you must cut rather dramatically into the steak, which lets the juices escape. The finger test: This method has you poke the steak with your finger or with some other instrument. With some practice, you can tell whether or not it's done from the springiness of the meat. To give you some assistance, some proponents compare the feel of the steak to the springiness of certain parts of your body, e.g., parts of your arm or your hand. The disadvantage of this method is that it is somewhat inexact. Besides, it takes practice to get the hang of it, and in the meantime you'll be ruining a bunch of steaks. The USDA method: Use a portable mass spectrometer to confirm that the combustion process has removed all hydrogen and oxygen atoms from the meat, leaving only carbon atoms that can be safely consumed. We use the digital thermometer method as the best way to determine that a steak is or has reached the right temperature. Using a digital thermometer is easy and fast and really is a can't miss way to determine how well a steak is done. If you've worked in a restaurant or cook hundreds of steaks then another method may work better but for the novice the simpliest way is using a meat thermometer. It is apparent that cooking times and temperatures will vary depending on the method of preparation, the shape of the steak and the size and desired degree of doneness. It is best to test roasts, steaks and burgers for doneness using a meat thermometer. It should be inserted through the side of the meat about half way through the cut. It is best to remove steaks, roasts and hamburgers from the heat with the thermometer reaches about 5 degrees short of your preferred cooking temperature. Once removed from the cooking surface meats will continue cooking with residual heat as they move toward the preferred temperature and while resting. Most Health Departments and the USDA recommend steaks be cooked to a minimum of 145 degrees effectively medium then rested for at least 3 minutes. Other meats like ground beef should be cooked to 160 degrees which is considered well done. It is important to remember that a piece of meat will continue to cook after it's pulled away from its heat source. Its temperature will continue to rise from 5 to 10 degrees afterward. So the tricky bit is to take it out just before it's done. This is easy enough if you're using the thermometer method, but a bit trickier otherwise. Once the meat has rested you may serve on a warmed plate to preserve the taste of the meat. When using a charcoal grill build a fire so that half of the grate is spread with a single layer of charcoal and the other half with two or three layers. Leave some space between the charcoals on the single layer. The single layer will be the area used for medium heat and for holding the temperature of steaks that cook faster than others. It is important to check the temperature of a steak in the holding are often so that it is not left to roast. When the coals have reached the desired temperature, meaning after the coals have burned down and you can test the heat level by holding your hand over the grating for no more than 2 seconds the coals are now ready. Put the steak(s) on the hot part of the grate covering with the top. Open the vents on the top and bottom of the grill. If you find that there is a flare up while grilling quickly open the lid moving the steaks to the side, close the vent to drive down the flames. Once the flames are down open the lid and move the steaks back onto the hot part of the grill, open the vents halfway. When the flaming is completely controlled open the vents again allowing the air to flow across the meat. Unlike roasts a steak can be served directly from the grill and eaten. Even though we find that placing a steak in a container or wrapping the steak for 5 minutes will improve the steak. The steak should have time to re-absorb some of the juices lost during its grilling cycle. That process takes place when the steak is allowed to rest. The heat and condensation form on the surface of the steak and is re-absorbed in the pours of the meat. The flavor reaches peak which resting is allowed to occur. For your sake and for your guests let the steaks rest at least 5 minutes. In the meantime prepare some baked potatoes or whip up some garlic bread.